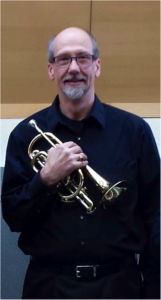 William (Bill) Krueger is one of RBB’s cornet players. He is a trumpet/brass teacher at Music and Arts in Germantown. Bill received his education in Massachusetts, graduating from Gordon College with a Bachelor’s in Music Education. He later graduated from UMASS Lowell with a Masters in the same field. His teaching career began in 1980 as the band director at Bellows Falls Middle School in Bellow Falls, Vermont. He later moved back to Massachusetts to teach general and instrumental music in the Lawrence Public Schools in Lawrence, MA. He was the director of a Christian camp and conference center in Groton, MA from 1995-2013. Currently he is the Music Director and Fine Arts Coordinator at Washington Christian Academy in Olney; leading the elementary, middle, and upper school instrumental, choral, and classroom music programs. Bill enjoys playing at his local church and at many school events. He and his wife Barbara live in Germantown.